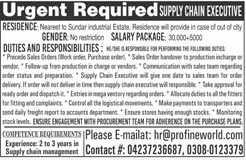 Sundar Industrial Estate is looking for candidates for the posts of Supply Chain Executive in Lahore. Interested candidates can contact on given details. dear sir, I hope you will be fine. I have done my master from the University of Lahore. I have 3 years experience in international company riz consulting and plus LQAS experience. I'm an MBA student with specialization in Supply chain management, logistics, procurement, inventory & warehousing. I'm the University Topper with CGPA 3.9 and currently looking for new job opportunities where I can utilize my knowledge and software skills in the best interest of the company. I have taken all the software classes mentioned in my profile as well as advance level of Microsoft Excel skills. Looking forward to work in a challenging & diverse environment and strive for Excellence.